Using iTunes, transfer all of your iTunes library content to your iOS mobile device. Download and install TouchCopy onto the computer you wish to copy the library content to. Connect your iOS device to your computer via the USB cable. In TouchCopy, click "Backup" to copy your content from your iOS device to the computer. 1. 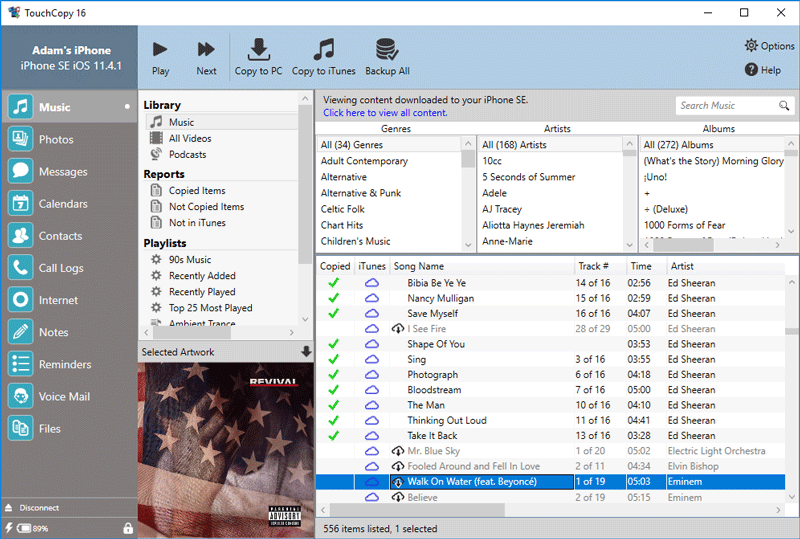 Ensure that your iPod/iPhone is loaded up with all your iTunes songs, videos and other content by syncing your device to iTunes on your old computer. Check our Apple's guide on syncing content from iTunes to your device. 2. Download TouchCopy and install it on your new computer. 3. Ensure that iTunes is closed before connecting your iPod. Then start TouchCopy and connect your iPod. TouchCopy will have fixed your iTunes preferences so that iTunes will not sync music or video with your iPod while TouchCopy is running. These changes are restored when you quit TouchCopy. 4. In TouchCopy, open the Music section, then click "Backup All". All music and playlists will then be copied from your device into your iTunes library on your new computer. TouchCopy will work just as easily if you're moving from a PC to a new PC or from a PC to a Mac. Mac formatted iPod? See our guide if you've got a Mac formatted iPod that you're trying to use on a PC. If you cannot fit your entire iTunes content on your iPod, you may need to load your iTunes content onto your iPod in smaller groups and copy it that way.